Hi everyone and happy April (seriously where is this year going?!) Today I wanted to share with you my take on a favourites post: my March Favourites: the blogger/vlogger edition! I spent the whole of March sort of M.I.A on here and it gave me the chance to become a blog reader/vlog watcher again which was so nice. It’s definitely given me the inspiration to start blogging again! So who have I been loving this month? I love Corrie’s blog anyway but it’s her youtube channel I have really been enjoying this month. I just find her so funny and relatable and I really look forward to her videos! She definitely deserves a ton more subscribers to her youtube channel, her videos are inspiring and I don’t know if this sounds weird but they have a really nice vibe, they don’t feel contrived or forced like some videos can and that makes watching them a joy! Another youtuber I have been loving this month is the lovely Meg. First things first I really like her voice (strange but true!) theres something quite calming about the way she talks which makes her videos easy to watch! I also feel like she really knows her stuff when it comes to beauty but doesn’t have that ‘I know better than you’ attitude, which makes me really trust her opinion and that (sadly for my bank account!) increases my beauty shopping list quite frequently! Sammi is a pretty famous youtuber and one I used to watch all the time! I’ve really got into her videos again recently, I particularly liked her video about what she eats on a day to day basis, I ended up making the bacon and avocado ciabattas and they were amazing! I love her channel because it’s such a nice mixture of health, fashion and beauty and I really look forward to her new video uploads! Oh and I always look forward to her lookbooks! Sandra has recently moved to London and her vlogs are just so interesting and fun to watch! She has been working hard to find a job and settle in a new city (not to mention a new country) and it’s great to see all the places she visits and find out more about London life (I moved from London a few years ago so I love seeing London vlogs) she deserves lots more subscribers so make sure you go and give her a follow! 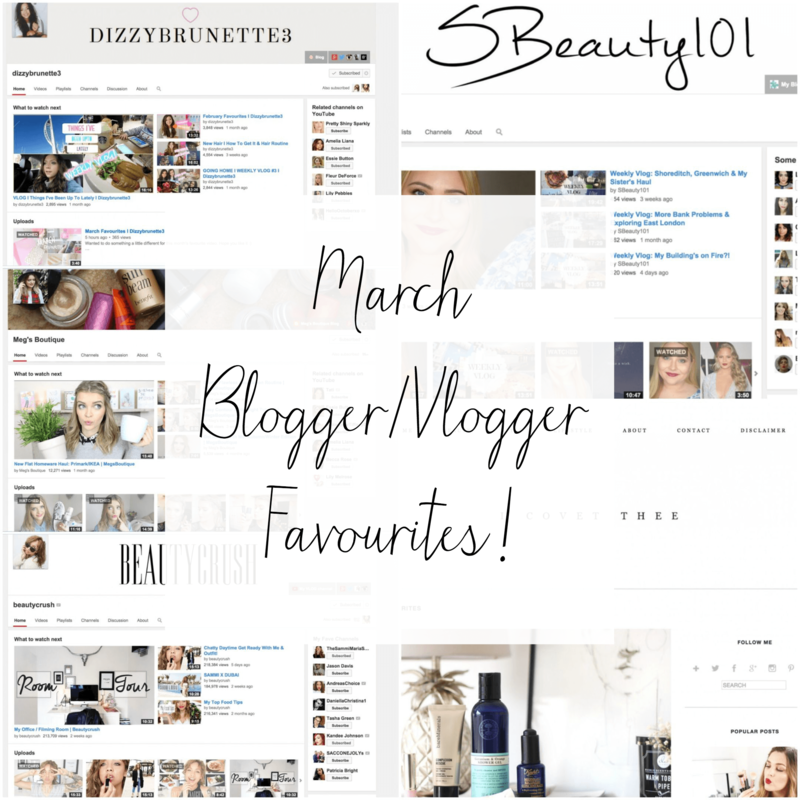 Do you have any march favourite bloggers/vloggers? I’d love to get some recommendations so let me know! "CHARLES AND WYNN PHONE CASE GIVEAWAY!"